To Tree or Not To Tree: That is the Question – #DoubleFML FatDarrellPalooza! What’s up Y’all? Ha, “y’all”…sorry, I’m feeling extra “Southern” today for some reason. It must have been the sweet tea I had earlier. Anyway, welcome to #DoubleFML FatDarrellPalooza! Anyway, yeah, this hoodie is great! It kind of looks like a Christmas tree ornament! And then I had the nerve to put that equally gaudy hat with it. Hey, they don’t call me a fashion daredevil for nothing. So, how was your Thanksgiving? Hopefully you all had a nice drama-free day with your friends and family. But if there was drama, hopefully you were at least able to record it with your cell phone. WORLDSTAR! Although I didn’t get to spend the day with my family this year, it was still great to lounge around the house, eat tons of food and watch football all day. Oh yeah, and for those of you drowning in Thanksgiving leftovers right now, there’s so much more to life than just turkey salad sandwiches. Although they are delicious, there’s a whole world of leftover options to explore! I know that I plug our Foodie group, “Phenomnomnomenal” on Facebook each post (which I’ll do again now…click here to join! ), but wow these members are so creative! If you haven’t checked it out already, you’re honestly missing out. It’s a really fun time in there! Seriously, I’ve gotten so many amazing Thanksgiving leftover ideas from that group! From Turkey Pho soup to egg rolls and amazing turkey pot pies, I would have never thought of many of these combinations! I know that we normally close out posts with recipes but since we’re wrapping up the Turkey Day discussion, let’s do it now. Besides, this one is too good not to share right away! 2 cups of cold leftover, mashed potatoes. Roll the cold mashed potatoes into 2-inch balls. Use leftover gravy and cranberry sauce for dipping. Simple and delicious – how awesome is that? When Angie first posted these in the group, I almost ate my phone screen! She’s really talented eh? Again, check out her blog at Cheffess.com and join us both in Phenomnomnomenal! Do you have a recipe you’d also like to share? Do you have a restaurant or food item we should all try? Tell us about it in the comments below! So, like I said last post, once Santa waves at the end of the Macy’s Parade, we go into full-blown jingle mode! In fact, I’m guessing that several of you already finished shopping and it’s not even December yet! And sure, some stores have had trees out since August and many of you have been itching to decorate for months – but now, it’s getting real! With that said, it brings me back to my yearly debate: to tree or not to tree? That is the question. Wow, this fortune cookie is surprisingly accurate! Seriously, should I bother setting one up? I mean, I live alone and don’t really invite many people over so who am I decorating for? The cable guy? The Chinese Food delivery driver? If I’m the only one who’s going to see it, what’s the point? Of course, I could always start being more social but let’s save my psychoanalysis for another day, shall we? Anyway, here’s the part where several of you may chime in that “it’s festive” or something about Fung Shui so yeah, I might actually dig those decorations out of storage this year. We’ll see. I’d better hurry up though because once the date in December gets into the teens, it’s probably not going to happen. Yes, he’s definitely my nephew, did you take a good look at those ornaments? Pizza? Bacon? A Cheeseburger? Ha, he really IS my little clone. I should honestly recruit him to set mine up! Seriously, if you swap out the John Cena action figure for Batman (although I also like WWE as you may have noticed during my Sheamus interview a few weeks ago) and replace the baseball with a football, it’s already perfect! Seriously, nice job Dom! I’m not sure what it says about my maturity level when I have the exact same interests as my 6-year-old nephew but again, let’s save my psychoanalysis for another day, shall we? I really do like those foodie ornaments though! Speaking of which, my friend Kim (thanks Kimmy Clause!) shared a story about a glass pickle ornament tradition that I had never heard of but is apparently fairly popular. Thanks again Wikipedia! There are several origin stories for this tradition, but apparently it’s been around since the late 1800’s! Who knew? If I ever host Christmas at my house, I’ll have to consider incorporating this idea. Until then, I suppose that I could have the aforementioned Chinese food delivery driver look for it if I actually go through with putting my tree up this year. No tip, but here’s a glass pickle! Merry Christmas and Happy Holidays…. Wait, am I allowed to say that? I can say both, right? Merry Christmas and Happy Holidays? There seems to be an endless debate about this because of the Starbucks cups a few years ago. I celebrate Christmas but know that there are many people who don’t. There are also several other major holidays during this season so Merry Christmas, Happy Chanukah, Happy Kwanza, Happy Festivus, whatever floats your boat. It’s all good! Hilarious…and true though. I mean, who’s to say there isn’t a planet full of blue alien bombshells out there that would make our human contestants look as basic as Uggs and pumpkin spice lattes? Oh yeah and shoutout to the new Miss Universe Demi-Leigh Nel-Peters of South Africa and to Steve Harvey for not traumatizing the first runner up this year by accidentally naming her as the winner, then taking it back. Whoops. Speaking of pageants, I was honored to have served as a judge for the Miss International Grand Latina pageant held in Buford, GA last weekend. Oh, why yes, you read that correctly. Actually, that was the fifth pageant I’ve been asked to judge. Crazy right? The guy who wears pizza tank tops and cartoon character pajamas is out here judging style and composure? The irony. Being surrounded by gorgeous Latina models is a difficult job but hey, “I do what I gotta do” ya know? Seriously though, shout out to Thalia Contreras and the entire the MIGL organization. I had a great time and congratulations to all of the contestants! Aside from the show itself, another perk for judging the pageant was the huge table full of authentic Mexican and Colombian food they provided me with! Either way, I forgot to take photos of that deliciousness, however I can share another greed-lead (ha, I just made that up but I like it!) that was recently forwarded to me. My friend Lori Casella told me about this Mexican restaurant that she visited in Toms River, NJ called Margaritas. Apparently they’re a regional chain that I hadn’t heard of but will definitely visit because they sell a 2lb taco! Yes, you read that correctly, 2lbs! It’s called the Taco Gigante! And it looks incredible (those are Lori’s sons: Preston in the sombrero and the little guy is Dominic in the photos)! God bless America, I need one of those asap! Next time I’m back in Jersey, it’s on! Oh yeah, and speaking of Jersey restaurants, Happy Anniversary to Ayman Elnaggar who’s been running the world famous official ®Fat Darrell Sandwich location, RU Hungry for 20 years now! Man, that reminds me, the ®Fat Darrell Sandwich turns 21 in January! Geez, it’ll soon be old enough to buy alcohol in the states! Wow, time flies! They grow up so fast don’t they? Do you have any more “Greed-Leads” for me to try out? Tell us about the restaurant or item in the comments below! On the opposite end of the Health Spectrum, let’s get into today’s fit tip and this too comes straight from our Phenomnomnomenal group! A few of our members were discussing their weight gain over Thanksgiving weekend but fortunately for them, we have several certified fitness experts and trainers in the group as well! The main takeaways from that open discussion was that much of the weight gained during the long Thanksgiving weekend was due to water retention from the higher sodium foods that were consumed during this time. Don’t panic! It’s not permanent so long as you get back to your regular workout routine and proper eating habits immediately! Whatever you do, do not give up and throw in the towel until January! As I stated last post, you’ll only be setting yourself up with a bigger obstacle to face as your resolution, so don’t wait until the new year, refocus now! Do you have a fitness question you’d like answered? How about an accomplishment you’d like to share? Tell us about it in the comments below! Do you have another song that fits today’s themes? Or do you have a song that doesn’t fit today’s themes but is just so good that we should check it out anyway? Tell us about it in the comments below! Again, shoutout to Angie Charpentier for providing the amazing recipe and Angie Starr for providing the awesome cosplay pics! She’s makes a pretty gorgeous alien eh? Perhaps I should have recruited a third Angie to provide the fitness tip instead so I could have completed the trifecta? Oh yeah, and “cosplay” is the art of dressing up as a character from a work of fiction for those who are unfamiliar. Angie Starr is one of the best cosplayers out there – you should see her Harley Quinn! Oh, and speaking of Cosplay and Harley Quinn, I finally got to catch the new Justice League movie last weekend and I personally thought it was awesome! As many of you know, I’m a huge Batman fan so I may be slightly biased but even I can admit that Batman vs. Superman and Suicide Squad were just okay. This on the other hand is a lot of fun! I wouldn’t let the critic’s negative reviews sway you too much. Although it’s not perfect (it didn’t top Wonder Woman – that superhero movie was nearly flawless) but I still think they did a good job with this one and would gladly watch it again. Actually, I think that I might go watch it again because since I avoided most of the reviews and commentary going in, I didn’t notice one of the major flaws that critics pointed out. I don’t think this counts as a spoiler since many of you have either seen or heard about this character being in the movie already but just in case, here is your potential spoiler alert warning. Okay, if you’re still with me, obviously Superman is in the movie too but due to scheduling, the actor who portrays him, Henry Cavill, had already grown a mustache for another role that had to be digitally removed! I honestly didn’t notice so now, I’d love to go back and look for it next time around. Smart move DC, perhaps second views will help boost the box office numbers a bit! Although I still need to catch Thor and a few others before I double-dip the Justice League movie. Still, for those of you who saw it too, I “mustache” you a question lol were you distracted by his facial hair? If so, did you already know about it ahead of time? Aside from Christmas shopping, that’s about all I have planned so far this week. Oh yeah, and possibly digging out my tree and ornaments. We’ll see about all of that though. Anyway, make sure to drop me a comment below with your vote on whether I should bother decorating before you leave and click the buttons on the side panel to follow me on Instagram, Facebook, Twitter and more! Previous Post Let’s Get Basted! Power Ranking the Sweet 16 Traditional Thanksgiving Menu Items! Okay okay, fine! I’ll decorate….maybe lol. Either way, thanks for your comment! lol oh that’s not just a seasonal hoodie – it’s beauty needs to be shared all year round. I might decorate…but then I’ll also have to put everything away later so hmm…. I need to recruit my nephew. I can pay him with Legos. And yes, Angie is Awesome! I need to try that recipe asap! No tree.. It’s unnecessary work before and after. I even store my mini artificial still decorated to save time. Enjoy everyone else’s hard work. I only do it because people pop in and I need the lift. Great post! Tree, tree, definitely tree! You should follow the lead of your handsome little nephew: Decorate that tree and/or put up some holiday display now!!! And while you are at it, play some joyful holiday music and let it fill the air while you decorate. You will feel great….while you jump-start your holiday spirit!!. True lol my little nephew did a good job – I wish he lived closer so I could put him to work! Ha thanks, I love that hoodie – it’s an acquired taste I suppose lol. My nephew did really well! I’ll have to find out where he got those foodie ornaments! Put up that tree!!! Or some form of decoration!!!!! You always come up with clever phrases. 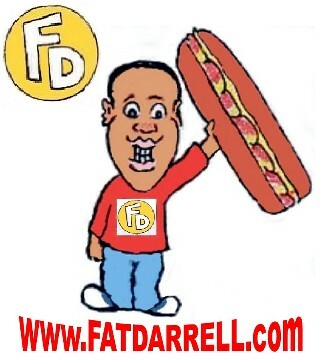 When I think about “Greed-Leads”, I think about all of the times that I have “pigged out” on some of my favorite foods, including my all-time favorite, your famous “Fat Darrell sandwich,” almost 21. Thanks for the coverage in this post! Awesome honor to have served as a judge for the Miss International Grand Latina pageant held in Buford, GA last weekend. Congrats on being a fifth time judge of those beautiful women.